It turns out my kids like Indian food. This is ironic because I don’t typically crave it. 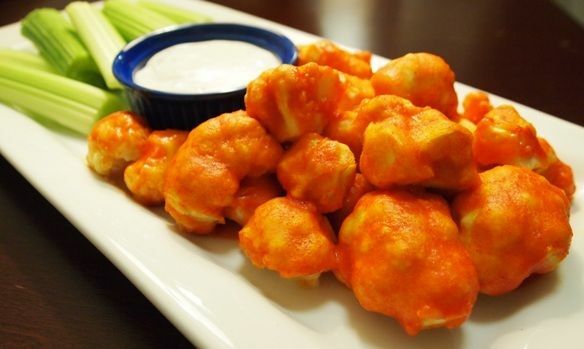 Don’t get me wrong – I like it fine, but there are only a few things that I would put on my list of favorite foods, despite having grown up eating Indian food for dinner six days a week. And many of those things I only like if my mom makes it. Spoiled, aren’t I? On top of that, I’ve been thinking about my four parents. They’re getting older and one day they will need to be cared for. If that’s the case, then I really should learn to cook Indian food more proficiently than I can today. My poor mother tried. Bless her heart…she really did. I helped make pooris, rotlis, bhakris, dhebras, you name it. I helped make every vegetable imaginable. 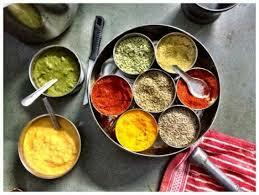 I sifted through endless cups of beans and seeds in thalis. And yet, I had no interest whatsoever in doing it so the moment I moved out of the house, I stopped making those things and now years later, I am no longer able. I mean…I have a general knowledge but I couldn’t make an entire meal for anyone or anything like that. It’s embarrassing really. And more than anything, i want to be able to feed our parents and bring them comfort in the form of food when they’re no longer able to feed themselves. Note: The words I used are the gujarati versions because, well, I’m gujarati and these are the words I know. I make the majority of food for my baby. 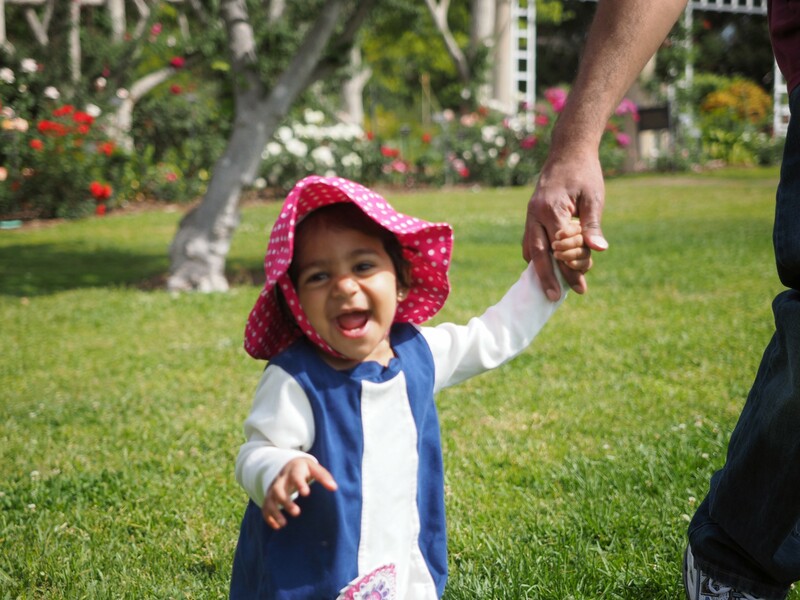 A few months ago, we traveled and because she wasn’t eating a whole lot of table food back then, I picked up some baby food pouches for convenience and so that we would always have food available for her. She LOVED eating from the pouches so I thought I would pick up some reusable food pouches so that we could have that same convenience but with added bonus of the food being homemade. I also liked the idea of producing less trash than if I bought more of those pouches. 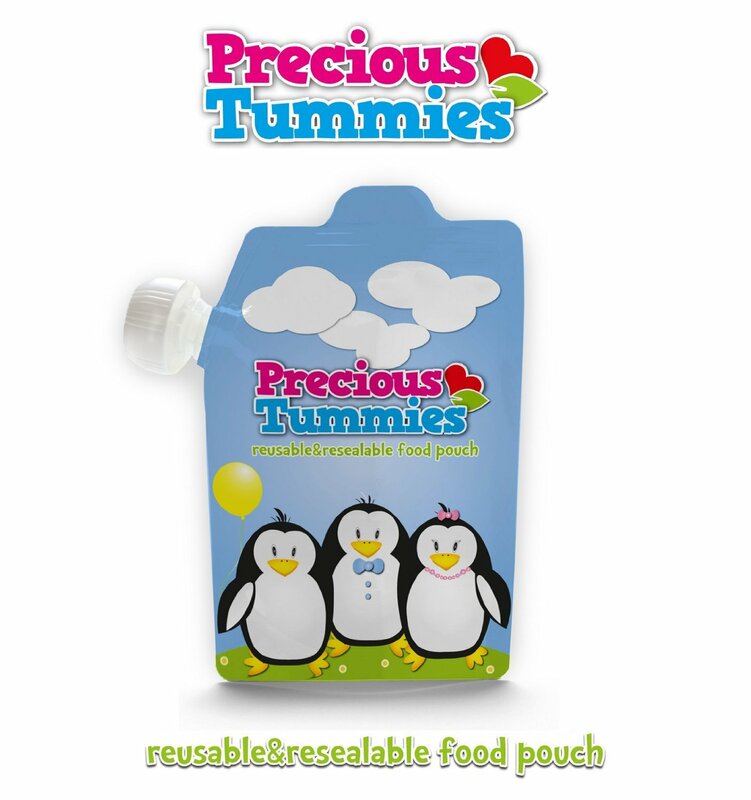 I looked around on the interwebz and found Precious Tummies Food Pouches. They seemed like they’d do the trick. I bought them and have used them a few times. I was super excited to use them when I got them – the packaging is adorable! 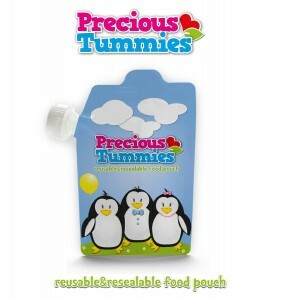 I love the little penguins on the pouches and the box and the girls were both instantly interested in the pouches. The price point was quite good – $10 for 6 – 6 oz bags. They’re dishwasher safe and freezer safe, which makes life easier. The dishwasher safe part was particularly helpful because otherwise it would be kind of hard to get all the little corners clean. These pouches (unlike most) are top loading so theoretically they can stand up on their own while you’re loading them and I guess they’d be less likely to leak since the opening is at the top, not the bottom. And of course, I love that you can save money with them. I don’t recall ever seeing pouches for less than $1 each. They include an extra cap, which I totally appreciate and the zipper is nice and tight – I would not expect these to leak. Unfortunately there were more things that I disliked than liked about them, though. While it’s great that they put a really strong zipper top on the pouch, they’re actually pretty tough to open, especially when you’re washing dishes and your hands are wet. Because the zip is at the top, it’s harder to clean (smaller opening). The thing that bugged me the most, though, is there’s no easy way to fill them. And there are no tips included in the box on how to best fill the pouches. I had to go on their website. I tried using several spoons, I tried using a pastry bag and tip, I tried using a funnel (I actually went out and bought a funnel just for these) but all ended up in a mess, wasted food, and a frustrated Crunchycake. The site recommends that you fill a ziploc bag and snip the corner and fill that way. Well, that’s extra work AND it doesn’t help my goal of cutting down on garbage. Also, there were no instructions or info sheet in the box. Fluke? Perhaps. But I want to know if I need to sanitize these and how I should go about doing that. All in all, these are ok but not great. I find that I’m not using them as often as I expected. Update: So these DID leak. And they’re not getting very clean, even when I wash them really well and then put them in the dishwasher. I threw them out. Sorry little penguins. I figure the more I talk about being vegan, the more likely it is that I’ll finally take the dive and become a full time (or even a weekday) vegan. I would say that 70% of my meals are probably vegan. I thought since I shared 5 quick vegan meals a couple weeks ago, it would be good to share five recipes that I really like. 1. 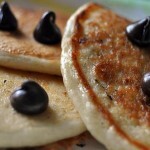 Vegan Pancakes – Super easy, simple and you probably have all the ingredients in your kitchen. I do half whole wheat flour, half all purpose flour and add blueberries for the kidlets. Made them this morning and everybody loved them. 2. 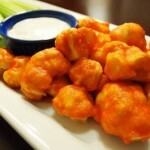 Spicy Buffalo Cauliflower Wings – I don’t like cauliflower. But I like these. Pretty easy to make. My only complaint is that the batter’s a little thick so I thin it out some. 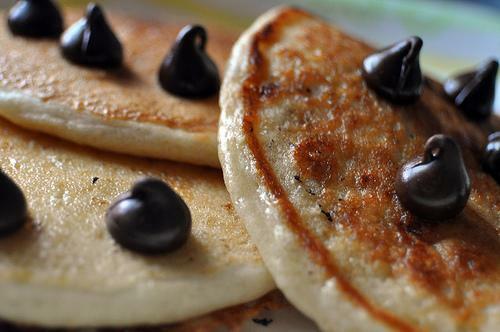 I use whole wheat flour for these too. 3. 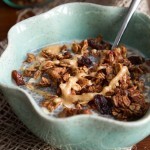 Cinnamon Bun Granola – My first attempt at making granola and it’s AHHHHmazing. The house smells great when I make it and we all scarf it down. My in-laws even asked for the recipe! 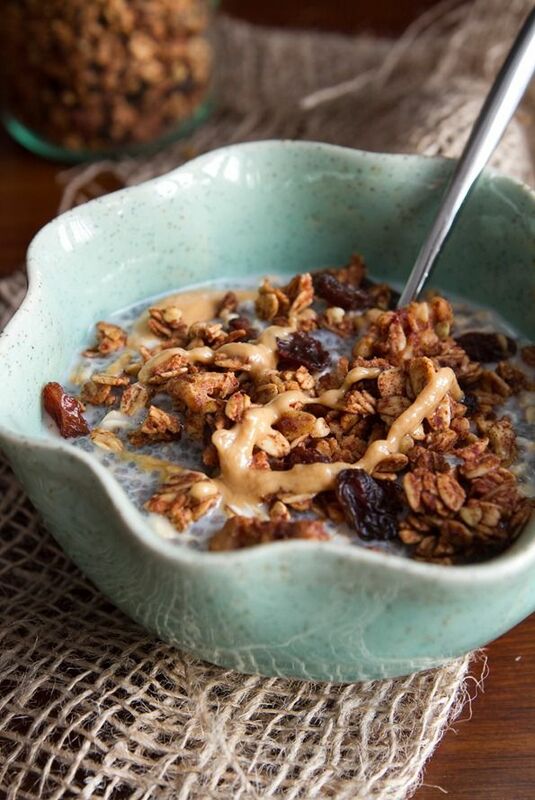 Sweetened with maple syrup and dates, you’d never know this was a vegan recipe. It’s sweet, cinnamon-y, and surprisingly very buttery tasting. 4. 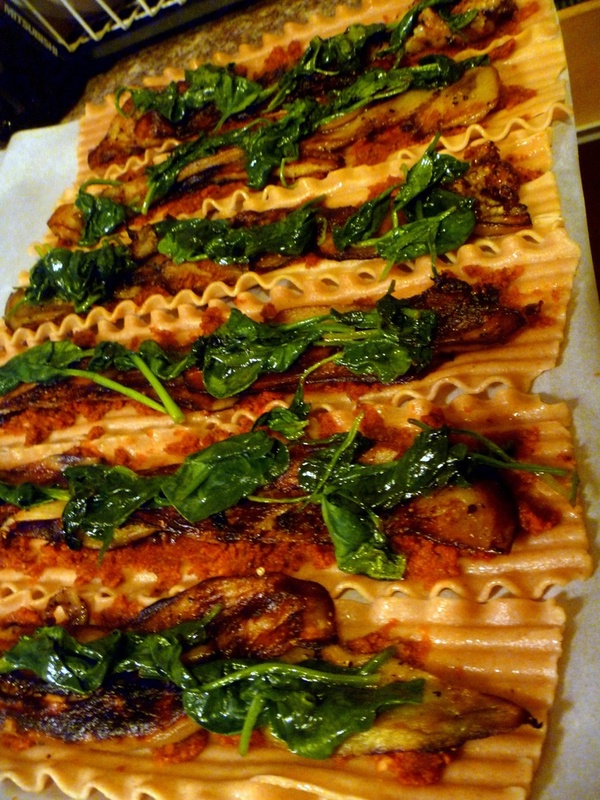 Eggplant Lasagne – The pine nuts in this make it rich and flavorful. I like using a few spinach leaves in each roll and do yourself a favor and use a good marinara sauce – Ragu or Prego won’t do this dish justice. Frying the eggplant is my least favorite part. Eating it is my most favorite. 5. 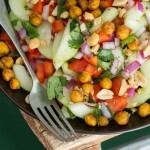 Thai-Inspired Hydrating Salad – This low-cal, low-fuss salad is delicious. I seriously eat the entire salad myself. 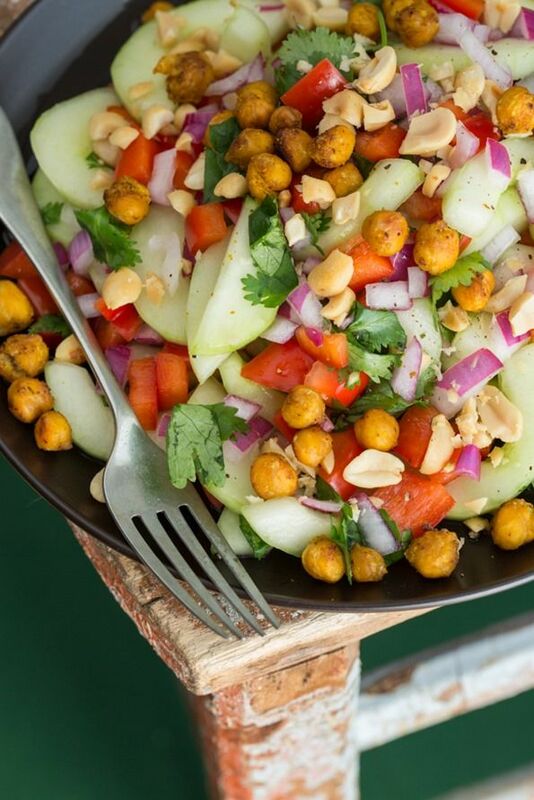 It’s crunchy and refreshing and the dressing is so simple. I made this for a party at my mom’s house and it was a hit! I want. Now. I try to cook vegan for my hubs whenever possible. 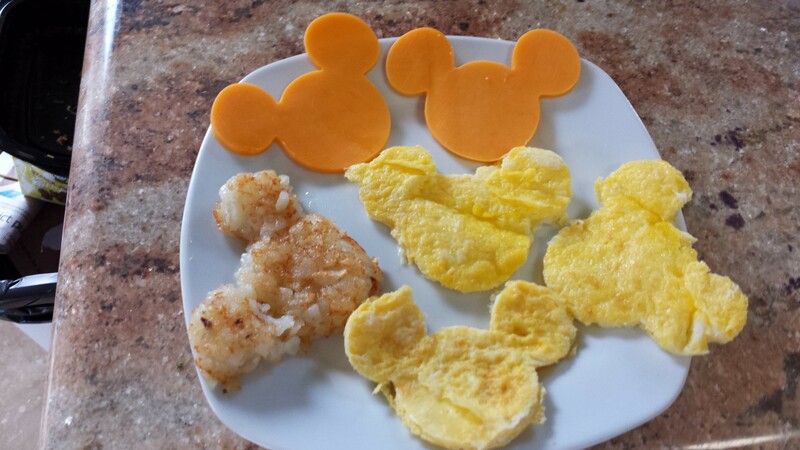 If I could, I would spend way more time in the kitchen and try to make some elaborate meals. But the reality is that we have two little ones and they command our attention. So I’m always looking for ways to cheat the clock. Here are five quick vegan meal ideas that will leave you full, satisfied, and proud of yourself for not doing take out (though I can’t lie – it’s not 100% homemade nor is it unprocessed and fully plant based but hey – it’s not take out). And all meals you can put on the table lickety split. 1. Khichadi: Khichadi is a North Indian staple food. It’s basically lentils and rice cooked together. Real simple: 1 cup long grain basmati rice, 1 cup toor dahl (split pigeon peas) and 2.5 cups water, ghee or butter, 1/2 tsp of turmeric and 1 tsp salt. Throw it all together in a pressure cooker and let the pressure cooker’s whistle blow 3 times. Or you can always cook it on the stove – add all the ingredients together (but up the amount of water to about 3 parts water) and bring to a boil. Cook on medium for about 15 minutes, then lower to a simmer on low for another 15 or so until the rice and beans are cooked. Serve alone or with a cucumber, tomato, and onion salad (throw in some chili pepper, salt, cumin, a wee bit of sugar, and a dash of lemon juice). 2. Trader Joe’s Pasta Penne Arrabiatta: We love this and it’s faster than any take-out that we can get. We live literally two doors down from a pizza place. In the time it takes my husband to go there and back, this dinner is done (this is true because sometimes I have him get me some garlic bread or fried zucchini to accompany the pasta). All you do is put some oil in a pan (or don’t), empty the bag into the pan, and heat through while stirring. That’s it. Seriously. Serve with a side salad (sometimes we literally open the container of baby spinach and grab raw spinach leaves and shove ’em in our mouths) and maybe some toast with olive oil and cracked pepper. 3. Tofu Pad Thai – Another huge cheat. Cube a block of tofu (press it between towels too if you have time) and fry on all sides with peanut or vegetable oil. Meanwhile, chop up some green onions and roasted peanuts. When tofu is almost done, pop a packet of Tasty Bites 1 Minute Pad Thai in the microwave. Empty into a bowl. Do a second packet. Toss with tofu. Top with peanuts and green onions. 4. Spinach Enchiladas – Preheat oven to 400 degrees. Wrap 12 corn tortillas in a wet paper towel and microwave for 1 min 15 seconds. Open a can of corn, a 2 cans of Hatch green chile enchilada sauce (ok fine, you can use any green enchilada sauce but this one is by far my favorite), a can of green chiles and a can of sliced black olives. Place several baby spinach leaves on each tortilla, top with some corn, green chile, and a little bit of sauce. Roll and place seam side down in a baking pan. Cover thoroughly with sauce and olives. Cover and bake for 15 minutes. We like to serve with tortilla chips and guacamole. 5. Nachos – not healthy but still vegan! My husband likes just chips and cheese. My first choice would be to load them up and get some more nutrition out of them. 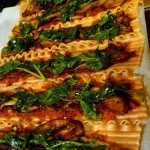 So start with the sauce – I love this 5 minute recipe from ohsheglows.com. It’s not real cheese but it’s not bad. Lay down some chips on a plate/platter, top with beans, olives, onions, jalapenos, avocados, salsa, and the cheese. This post would be way better with some pictures. I’ll see what I can do about that. But there you have it. Five really quick ways (the enchiladas probably take the longest and even then, about 30 minutes) to eat vegan; if you’re trying out being a weekday vegan, this is a simple, quick path for you. 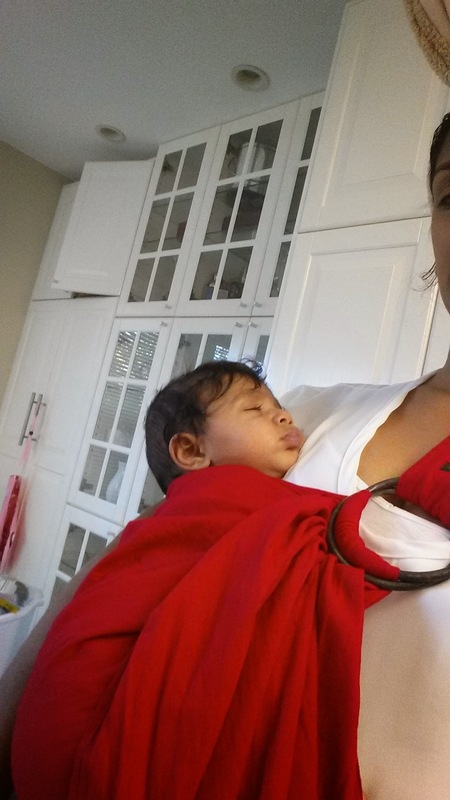 After the initial thrill of starting solids, my younger daughter stopped liking solids. 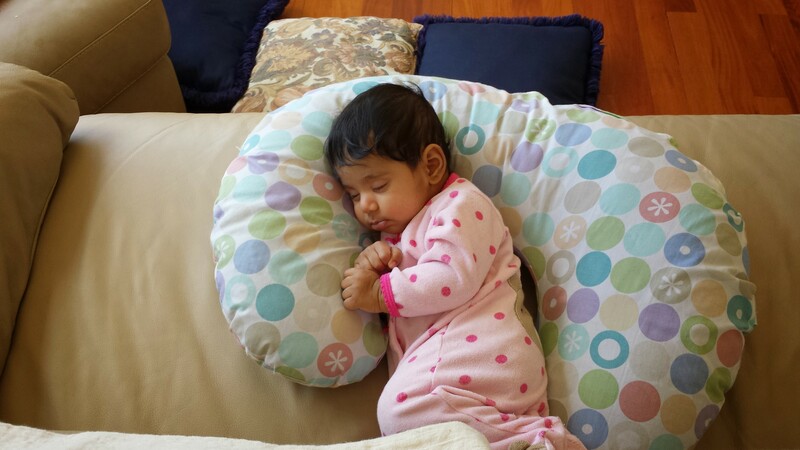 I had a tough time getting her to eat any purees and whenever I’d try to feed her, she’d grab the spoon and try to feed herself. So it made perfect sense to me that I should try baby led weaning. For those of you not familiar, the thought behind baby led weaning is that babies should learn to chew before they learn to swallow, they should feed themselves, and that they should eat what you eat (minus the over-processed, sodium heavy foods). As long as the baby is able to sit up, feed themselves, and chew, they should be able to do this. Basically instead of spoon feeding your baby purees, you give them whole foods and you don’t hold off on table foods. It’s supposed to give your baby the skills to eat themselves and it’s supposed to encourage their own ability to self regulate food quantities for life. 1. Just because a baby can sit up, doesn’t mean that their stomachs are ready for some of the harder to digest foods that are recommended by the book. We didn’t start solids until six months for both of our girls. They both had allergies and we didn’t want to push their digestive systems too early. 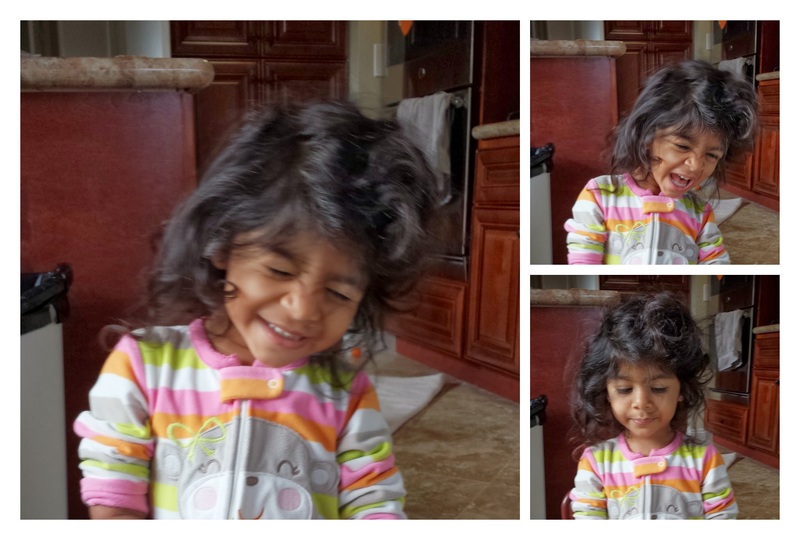 I found that the little one would get constipated when I’d let her eat things like bread. The book sort of walks you through what’s appropriate at what age but honestly, I think people just hear that you can feed your baby what you eat and they don’t use good judgement. I’ve heard of people giving their babies Cheetos! 2. It makes a huge effing mess. Babies + solids = mess. I get that. BUT baby led weaning makes things so much worse. She basically threw her food around and smooshed it in her fingers and splattered it all over her clothes. The book even says to expect it. But it’s really no fun to have to clean up the booster, the tray, the chair the booster sits on, the carpet, the dining table, AND the baby every single time we eat. She doesn’t seem to enjoy a messy meal any more than I do. So why go through this? Granted, even when I’m feeding purees, we sometimes have a mess, but at least that’s manageable. 3. You can’t tell how much they’ve eaten. 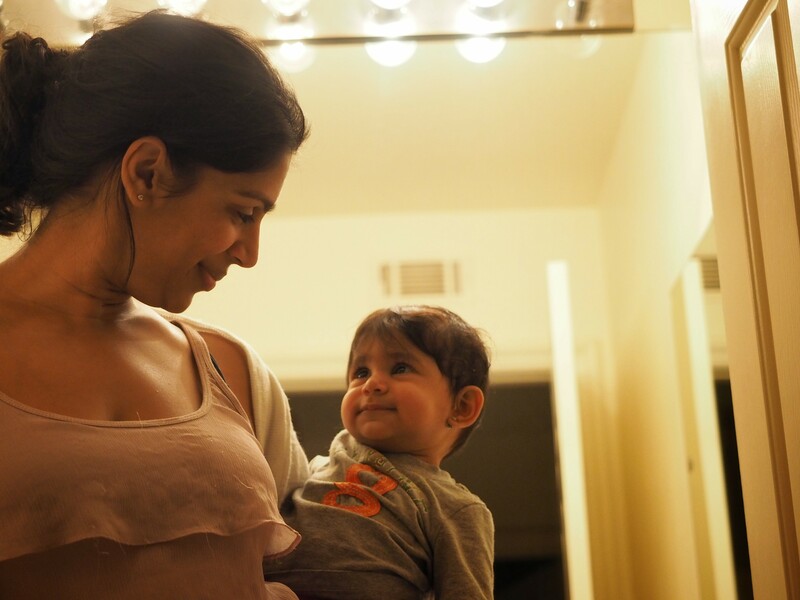 Because baby is feeding herself, I constantly found myself wondering how much she actually ate. I know solids aren’t critical for babies under the age of one, but i do like to have a sense of what she ate. Let’s say I gave her two sticks of steamed zucchini. After a few minutes, they’d be gone from her tray. I would get hopeful that she actually ate all of it. Between the gumming, the throwing, the smashing and the dropping, I was completely wrong. More often than not, the majority of the food was on the floor or smashed under her legs. Many days I scramble. I scramble to get food on the table for my family. I scramble to change yet another diaper. I scramble to get both the girls bathed and off to bed. I scramble to write up another blog post. But sometimes it occurs to me that my little girls deserve to have some fun in their lives for no other reason than they’re little and life is fun. And little things bring delight. One of the things that I admire most about my mother-in-law is her ability to recognize and appreciate beauty in the world and to take joy in that. I have inherited my mother’s ability to work hard but it often comes at the expense of enjoyment. 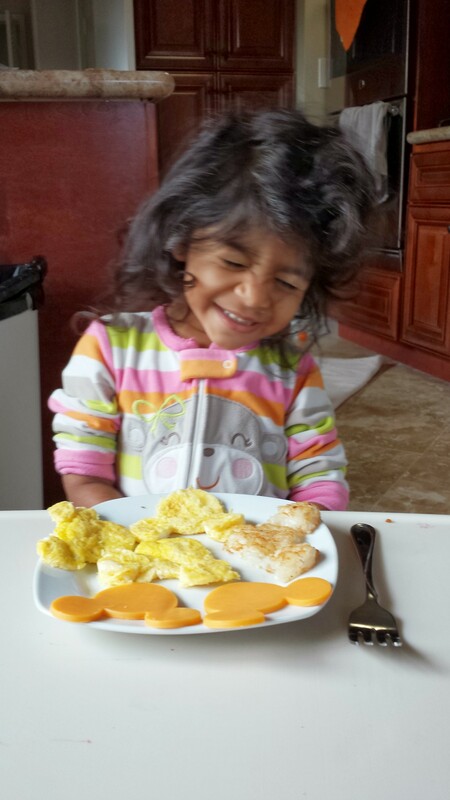 So the other day, I decided to surprise my little girl with a special breakfast. It didn’t take much extra time. Her sister and I didn’t mind eating the “scraps” so that she could enjoy it. Oh, that face. How can I pass up an opportunity to bring a smile to that face? So last week my MIL called and asked if I wanted any lemons. I said “Sure. Maybe just a few – not too many.” She replied “so two or three?” “Yep, mom, that’s perfect. Two or three.” Then later that day, I met my neighbor for the first time and he said “Do you use lemons for cooking or anything? 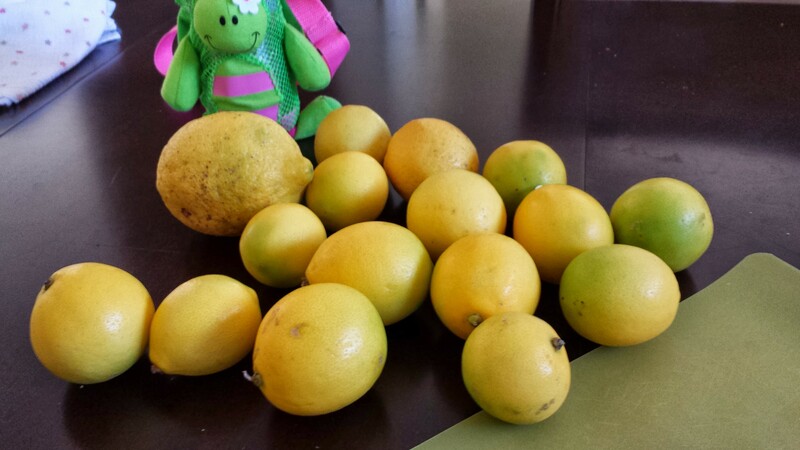 We have this tree and don’t know what to do with all these lemons. Here, have some.” So before I had the chance to say no, he handed me three lemons. I took them. When my in-laws came, Mom handed me a bag and when I looked inside, there weren’t 2-3 lemons. There were a dozen lemons. 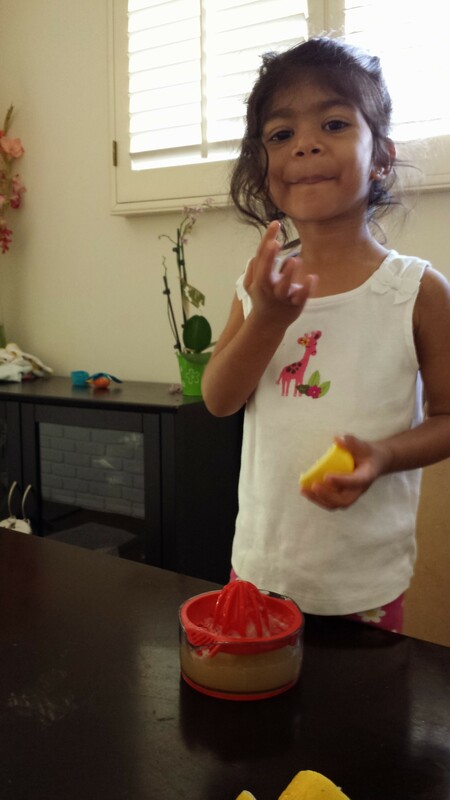 Maybe she intended some of those lemons to go to my mom’s and brother’s houses. I’m not sure because she didn’t say. She is super generous so maybe she didn’t feel comfortable giving us “only” two or three. I don’t know but I found myself with fifteen lemons and no real need for any of them. 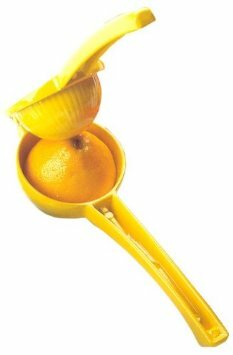 By the way, I also had bought one of those lemon shaped squeezy things full of lemon juice. I wasn’t amused when I saw that there were more ingredients in it than lemons. But it would also cost $30. And I’ll bet I wouldn’t be good at squeezing with that thing. So at this point, it seemed silly to me to spend $30 on yet another utensil (I have a lot of kitchen utensils. A LOT.) for some lemons that I didn’t really have a use for yet. I like free stuff but really, I couldn’t justify spending that much to make use of 15 or so free lemons. I gave it one last try at our local HomeGoods store and luckily spotted at citrus juicer for $4.99. Yay! My lovely assistant and I have juiced about half the lemons so far – it’s really easy and I’m surprised by how much juice a little bitty lemon can yield. Maybe I’m surprised because usually I juice them by squeezing them by hand and they don’t put out that much. So about half the lemons yielded a whole ice tray full of lemon juice. I believe each ice cube is two tablespoons and there are 14 cubes, so almost two cups of lemons so far. And since they’re frozen, I can just use a cube at a time as I need them! Hooray! Usually I buy a bottle of lemon juice for around $3 and it inevitably goes bad so it’s a waste and it has added crap and it produces garbage. This route does none of that! I might be a little biased, but I think the ones from my in-laws’ house are much prettier and lovelier. They actually juiced better too. Maybe because of the type of lemon. Maybe because I know they were grown with love. This fall’s harvest has been good. My in-laws also brought us about 20+ figs and some persimmons. The figs are the expensive mission variety and though I don’t care for them, my husband and both daughters enjoyed them. I’m always shocked at how expensive they are, even in season. I think I saw a basket of maybe 5 figs at the farmers market that was $6! Crazy. And they also brought us delicious persimmons. I’ve been putting them in Miss K’s lunchbox and I think I’m going to steam some for Super S to try. I had made baby food out of some from their yard for Miss K. when she was a wee one two years ago. My parents gave us two huge pomegranates from their yard too. I’m going to bust them open this week. Those are full of antioxidants and Miss K. loves them. I’m so embarrassed to admit this but it’s still a thrill to get food from our homes. I’m so used to only eating foods that were bought at the store that it’s exciting (and a bit strange) to just go pick them from the yard and eat them. I love this. I really really REALLY need to try hard to grow some veggies next spring. It would be so nice! Maybe not cost effective, but wonderfully fresh and less trash produced! Food waster? Guilty. So, so guilty. I saw the following infographic from upworthy.com and started feeing the self loathing tick up. I am so so SO guilty of throwing away food. Learn more about “ugly” food vs. spoiled food. Use food when it’s ugly, thow out food when it’s spoiled. Force myself to get creative with using up food before garbage day. We now have four people who eat food in this house. I need to use the food, not waste it. Eat left overs, dammit. Avoid fast food and just use what we have. Juice up left over fruits and veggies. Start a food waste friday post. Shame myself into wasting less. Oy. Let’s do this. We’ll start next week.